Pimcore is built for developers and should empower them to build great digital experiences easily. 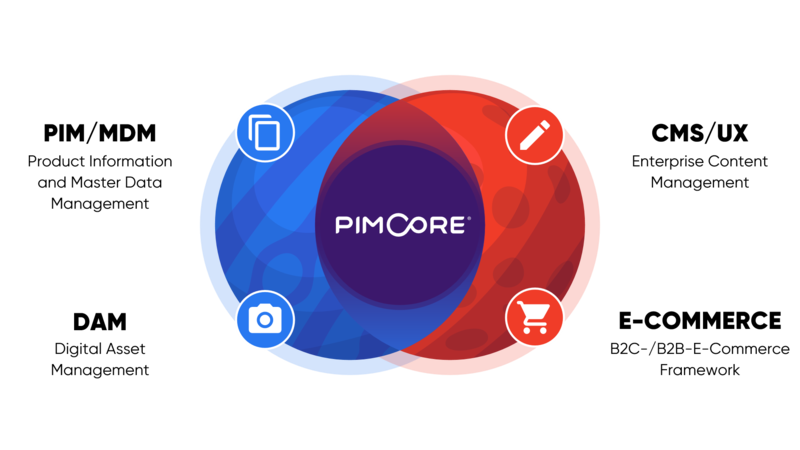 As a consequence, Pimcore is NOT an ‘out-of-the-box’ software product like Wordpress, Magento, Akeneo, WooCommerce, Shopify and others. You need a developer to get started. Objects are the PIM/MDM part of Pimcore and are the way to go for managing structured data within Pimcore. Based on a class definition that defines the structure and attributes, objects can be used for pretty much any structured data – may it be products, categories, persons, customers, news, orders, blog entries, … For the attributes, many data-types (simple ones and really complex ones) are available. As Pimcore is a platform that stores data independently from the channel ,it can provide the managed data to any channel – simple websites (B2B, B2C), commerce-systems (integrated, third party), mobile apps, print, digital signage, ... there are basically no limits. In terms of output to the frontend or custom APIs, Pimcore follows the MVC pattern and is based on the Symfony Framework. If you don't know the MVC pattern please read this article first. If you are new to Symfony you should read the getting started guide of Symfony first. With this knowledge learning Pimcore will be much easier.